I understood writing could be dangerous. I didn't realize the danger came from the machinery. Title Designer RANDALL BALSMEYER of Balsmeyer & Everett (now Big Film Design) speaks about the Naked Lunch title sequence in this excerpt from our Dead Ringers article. 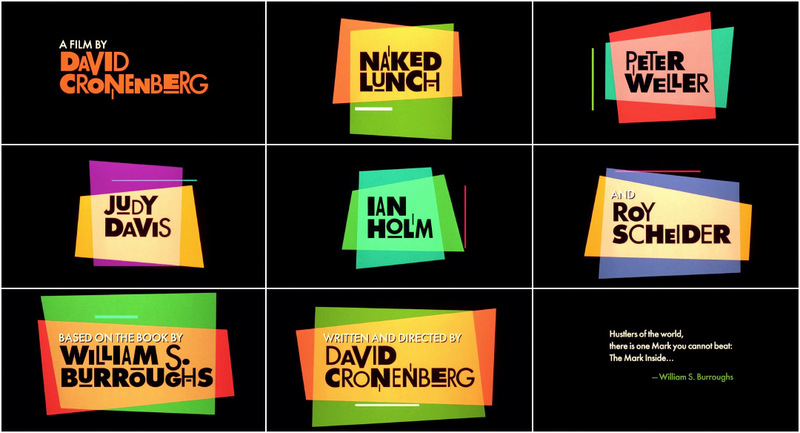 What can you tell us about the production of the Naked Lunch title sequence? 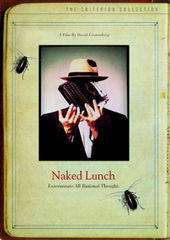 Randy: Naked Lunch was a very frustrating project with a happy ending. When you love somebody as much as we love David [Cronenberg], when he asks you to do something, you want to come to him with something really huge and elaborate, and we tried. Randy: The final title sequence was shot on our animation–motion-control camera. The names were all shot onto hi-con black-and-white film. That film was developed and put back into the camera as a bi-pack roll, that would hold out the names while the colour shapes were shot. The shape art was all black tape and construction paper on clear animation cels, backlit with colour gels underneath. Each colour shape was shot separately, winding the film back in the camera for the overlaps. So two rolls of film passed through the camera simultaneously: the matte roll and the unexposed colour film. The third colours were a result of the shapes “adding” to each other, which we had tested extensively prior to the final shoot. Once the colours were exposed, the matte roll was removed from the camera, and we made another pass to expose the white titles. Randy: I always thought the cool part of this sequence is how the names are only revealed by the presence of the colour panels. It’s like they are there all the time but hiding! Title Design: Balsmeyer & Everett, Inc.